Sialadenitis is inflammation of the salivary gland. It can be acute or chronic and there is a wide array of potential causes, from infection to autoimmune. It most commonly affects the parotid gland; indeed, parotitis is more commonly seen in hospital admissions compared to submandibular sialadenitis (which only make up 10% of the cases). Viruses are much more common than bacteria as pathogens causing sialadenitis. Of viral causes, mumps is the most common, affecting either the parotid (more common) or the submandibular gland, yet other viral causes include coxsackie, parainfluenza, and HIV*. 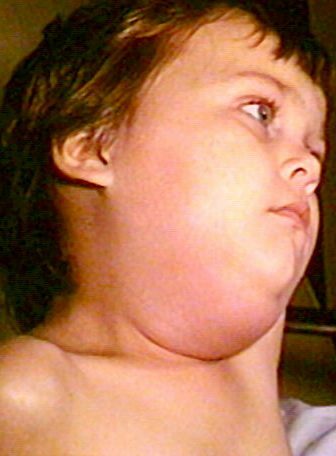 Mumps parotitis is caused by the mumps virus, a highly contagious virus transmitted by respiratory droplets or direct contact. Patients complain of prodromal symptoms lasting a few days, including a low grade pyrexia, headache, and malaise. Patients will then develop bilateral gland swelling (although can be unilateral). Complications of the disease include meningitis / encephalitis, deafness, pancreatitis, and orchitis. Mumps is a preventable disease with use of the MMR vaccination, however there is no cure and treatment is purely supportive. It is a notifiable disease. Patients will commonly report painful swelling and tenderness of the gland (Fig. 2). Pyrexia, lymphadenopathy, and erythema of the affected gland can all also develop. Infectious causes may result in a purulent discharge from the duct, alongside any additional symptoms from any potential abscess formation. Routine bloods (FBC, CRP) will identify any infective cause; any suspicion of autoimmune disease, serum ESR, and autoimmune screen bloods will be warranted. Pus swabs should be taken if possible and blood cultures if any evidence of systemic involvement. If mumps is suspected, suitable viral serology can also be tested. If there is suspicion of malignant disease, a fine needle aspiration cytology should be performed to aid diagnosis. Ultrasound scan will identify any solid masses or fluid collections suspected within the glands. A CT scan may be requested if there are any suspicion of deep neck space abscess or malignancy. Most patients are managed conservatively, with hydration and analgesia (NSAIDs, paracetamol, and moist heat). Artificial salvia can be used in cases where saliva production is impaired. Antibiotics should be given if bacterial sialadenitis is suspected, with choice of empirical antibiotics based upon local guidelines. Patients are advised to have sialogogues, such as lemon juice, which promote saliva production and milk / massage the gland. Severe cases can result in abscess formation, which may lead to airway obstruction which is a medical emergency. In chronic sialedenitis, patients may develop a cutaneous fistula. Autoimmune parotitis has been associated with an increase incidence of lymphoma. Which is the most commonly affected salivary gland in sialadenitis? Heerfordt's syndrome is a form of sarcoidosis, composed of what triad of symptoms? Which cause of sialadenitis has been associated with an increase incidence of lymphoma?